Personally, I think it is one of the most beautiful areas in Italy, and one of the most picturesque coastal areas in the World. All the towns are small enough to walk them through but also to hate people and cars when you drive. So either you can be very patient with the traffic, or you should go by bus or by boat. Buses travel all around the Amalfi coast, and they can relieve you from driving on very steep hills, with quite complicated curves and slopes. Moreover, the parking spaces are almost inexistent, so you will have to pay one of their expensive private spaces. The downside is that the buses become overcrowded, especially during high season (July-August). So be prepared for queues and a pushy crowd. 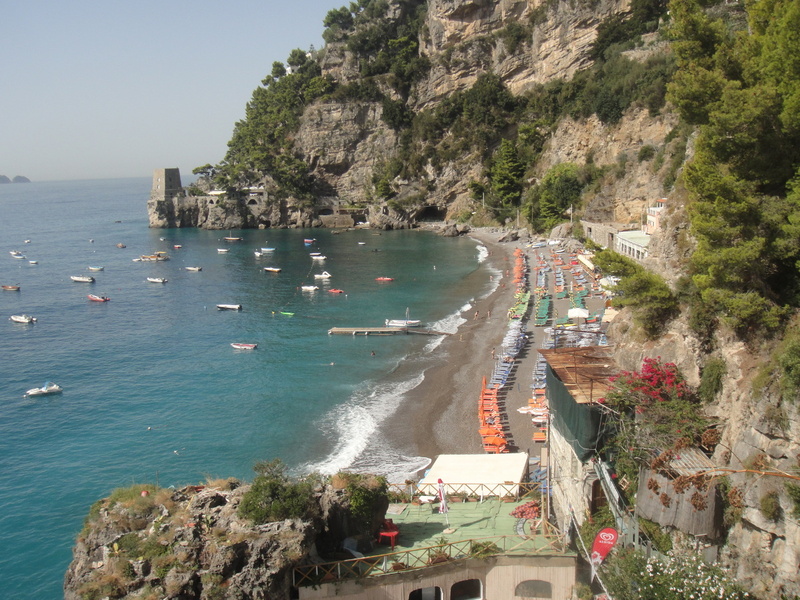 The SITA local bus network travels to and from Sorrento via Positano and Praiano and onwards to Furore Fjord, Conca, and its Emerald Grotto. Buses also travel to and from Salerno from Amalfi via Minori, Minori, Cetara and Vietri. Positano is approx. 40 minutes from Amalfi (depending on traffic). 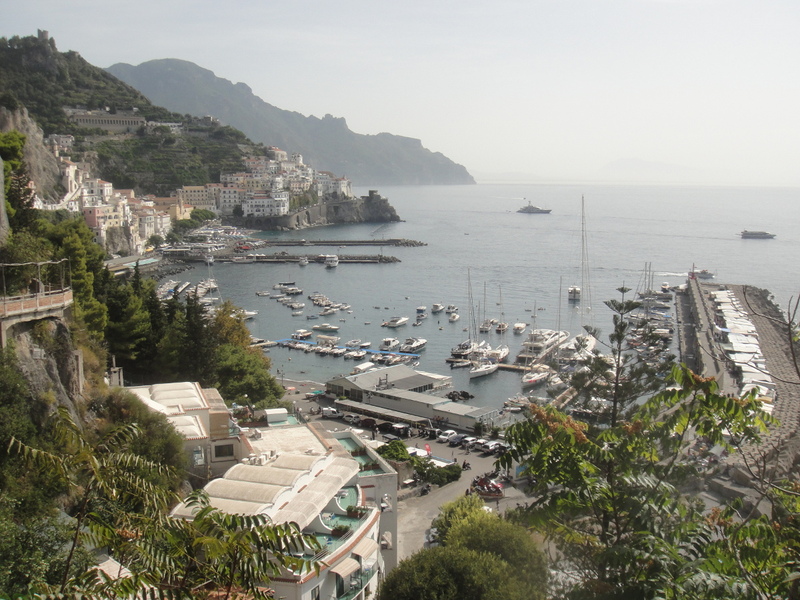 The trip to Amalfi from Sorrento is approx. 1 hour and 15 minutes (depending on traffic) otherwise this can blow out to two hours [wikitravel]. You can check prices and timetables on their official website or positano.com. To sum up: very narrow, hilly and cliff-hanging roads. Plus expensive and scarce parking. There are, of course, a few advantages. Besides the “freedom of movement”, you will find a lot of little and pretty spots and towns that are only easily accessible if you have your own car. I rented a car anyway, but my brother drove all the time. The overall experience was not that bad, but I would consider using the bus the next time. My only advice would be to locate a private parking in advance and go straight to it (put it in your GPS if necessary), so you will avoid dead ends, traffic jams, and arguments with your co-driver. Hiring websites: EasyCar, EuropCar, Expedia. The boat can also be a good option, especially if you are fond of travel packages. Ferries normally runs from Easter to late October from Amalfi to Positano, Salerno, Capri, Naples and Sorrento. There are two main companies, one is headquartered in Naples and it is called Metro del Mare, and the other is headquartered in Amalfi and it is called Coop Sant’Andrea (a consortium including a few companies). Linee Maritime Salernitane (Ph: 089/873301 in Amalfi; 089/811164 in Positano; 081/8073024 in Sorrento). Positano ferry and hydrofoil ticket office (Via del Brigantino, Italy. PHONE: 089/811986). For ferry and bus timetables in English, you can also refer to Amalficoast-Web or positano.com. 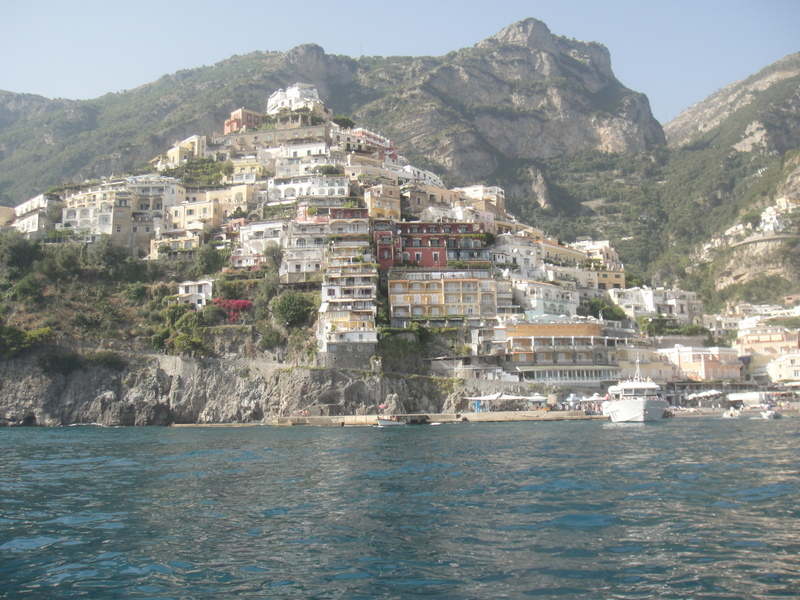 There are also private boat charters offered at the ticket kiosks on the piers in Amalfi and Naples. Even if you do not decide to visit all the towns by boat, you will probably want to visit Capri, so you will need to take at least one boat. People from different areas of Italy can be very different, as in any other country in the world. It is not an exception in Naples. The city and his people have a very special reputation. There are plenty of stories and rumours regarding its mafia and the number of robberies and crimes. They even say it is Italy’s scariest city. Personally, I do not think it is that bad. But I only stayed one night. I can say that the traffic is terrible and the place is noisy and untidy. But it has a lot of personality and charm. In our case, we took a train from Rome (Roma termini) to Naples. And only 20 minutes after departure we were talking with a very nice and friendly “Napolitano”, whose name was Salvatore and who recommended all kind of places in Naples. Our first question was: –Where can we find the best Pizza Napolitana? And without a single thread of doubt, the answer was: —Starita. So we headed there that same night, and I have to say it was one of the best pizzas I ever had. I had one with rocket, Parma ham, and parmesan, as you can see in the picture below. Lastly, our new friend recommended two ice cream (gelato) shops, each of them with a flavour speciality. So for chocolate (cioccolato) the winner was Casa Infante and for pistachio (pistacchi) was Fantasia. We decided to stay in this town, and I think it was a very good choice. We chose Hotel Bellevue Suite and we liked it a lot. It was located just outside the town, with a very modest breakfast, parking space (something valuable because it is very limited), and beautiful, clean and tidy rooms. It was not cheap, but nothing is very cheap in this area. The downside is that it is uphill, so to go the pier and town is easy, but not the way back. So if you do not like hills, you may want to take a taxi on the way back or go by car. The parking spaces are scarce, but you can leave it on the pier for €5 per hour. We decided to stay here because it is near the other towns we wanted to visit, but it is slightly bigger (not than Sorrento) and has more options in general. Some people stay one (or more) night in each of the towns. The downside of this is the amount of packing and check-in/out you will need to do. So I think it is much better to select a place as the base. Two restaurants I would recommend are Da Gemma and La Perla. The seafood we had there was superb. You have plenty of options in the town, including cheap and fast options with a variety of paninis, pasta, and pizza. 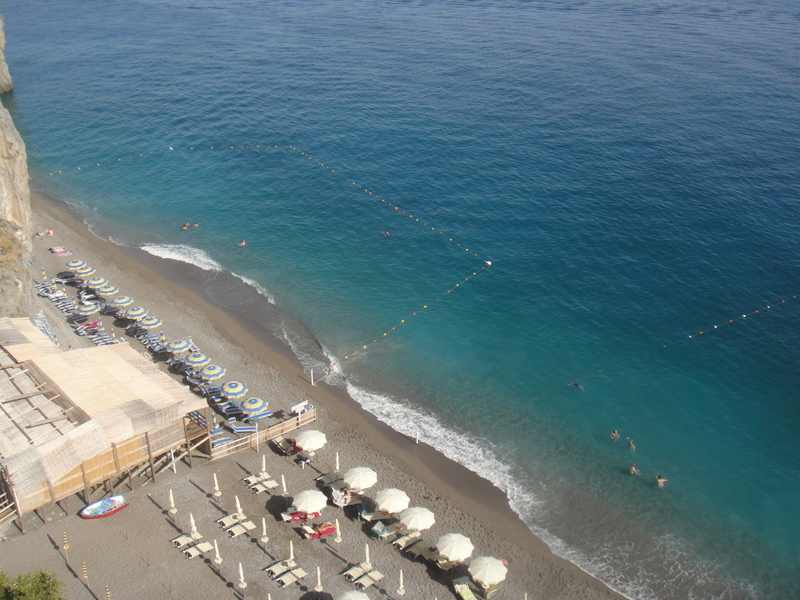 The picture above shows the main beach of Amalfi, which is next to the port and city centre. You can rent an umbrella for the day and you have a few restaurants nearby. 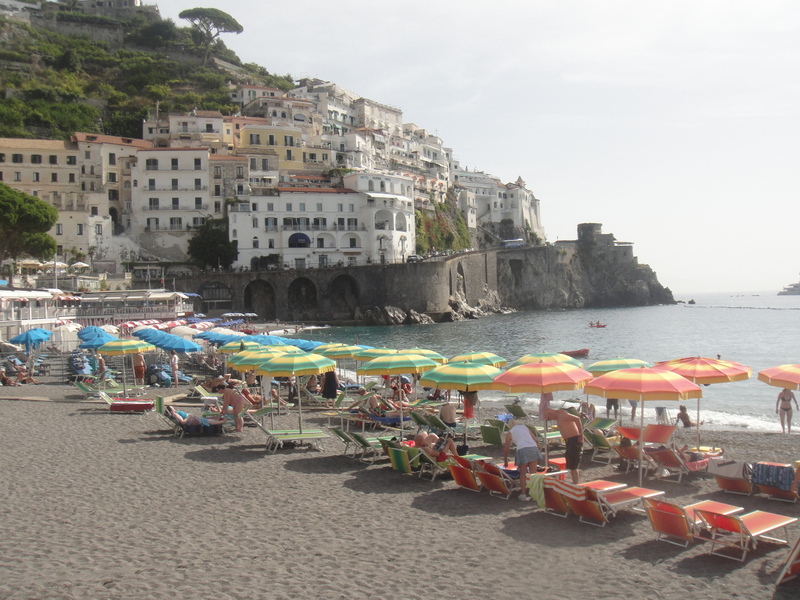 But the nicest beach in Amalfi is another one called Duoglio. It is only 1 km away from the town/port. But there are around 400 steps from the road to the sand. The other option is to take a lift/elevator which is owned by a hotel and costs €20. There are two establishments and one of them rents equipment for windsurfing, scuba diving, and canoeing. The sun leaves the beach in the early afternoon, so it’s worth getting there early. Positano was my favourite town on the trip. It is extremely photogenic, picturesque and stylish. There are colourful and beautiful houses from the top of the hill down to the shore. Not surprisingly, all this beauty is reflected in the prices, which are higher than the rest of the coast. Only a certain part of Capri can be as expensive as Positano. In John Steinbeck words: “Positano bites deep. It is a dream place that isn’t quite real when you are there and becomes beckoningly real after you have gone”. The beach is a bit rocky, like in most of the area. But the beaches are still nice and the water crystal clear. Just below the centre of town, you can find the main beach, which goes from one side of the town (its eastern limit) to the port/wharf/heliport. But on the other side, you will find a larger and less crowded beach, and you can walk on the sand until the very end (western limit), where another hill is closed for a private villa. On the picture below you can see both sides. In both places, you can rent umbrellas and chairs. You also have pubs, restaurants, and other establishments. There is also a church that you can visit very close to the beach. One of my favourite places in Positano was La Zagara. It is a bakery, restaurant, and pub. The garden is lovely and relaxing, ideal to enjoy an Aperol Spritz. Capri is a legendary island, probably the most famous one in the country. It has attracted Roman emperors, celebrities, prominent businessmen and millionaires in general for ages. Its landscape is scabrous and uneven, with colourful houses facing its main pier/harbour (Marina Grande). It is a common destination for huge Mediterranean cruises, which you can normally see from the shore. It is also well known for its stunning upscale beach resorts and high-end/super-expensive shops selling clothes, jewellery, and liquor. In our trip, we arrived at Marina Grande (picture above) and we went straight to the beach (picture below). Even that it is surrounded by boats and very close to the pier, we really enjoyed it. It is pretty and the water is clean and blue. There is an excellent spot at the very end of the beach, facing the pier. You can even find thin sand and no rocks. We then took the funicular to Capri. It departs every 15 minutes and also takes 15 minutes. It costs €1.80 and the only downside is that you will probably need to queue for some time. Once in town, we walked around and had lunch. There are very scenic spots and wonderful sights. Almost the entire island is accessible for hiking. So if you have time you can enjoy these beautiful natural trails. Only bear in mind that some of these paths are very steep and you need to walk up and down long stairs. You can get a map with all the footpaths at the tourist office in the harbour. We spent only one day in Capri, so our options were very limited. If you have more time, you should definitely go to the other side of the island. 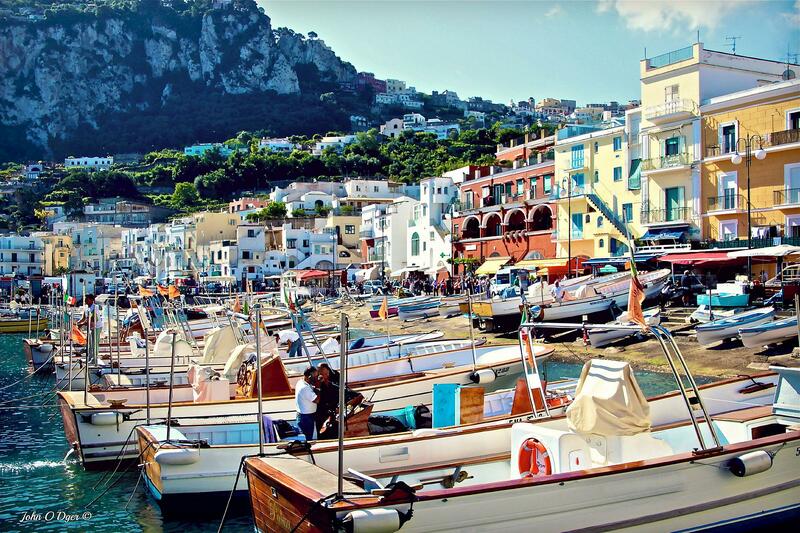 You can visit Anacapri and also Marina Piccola. 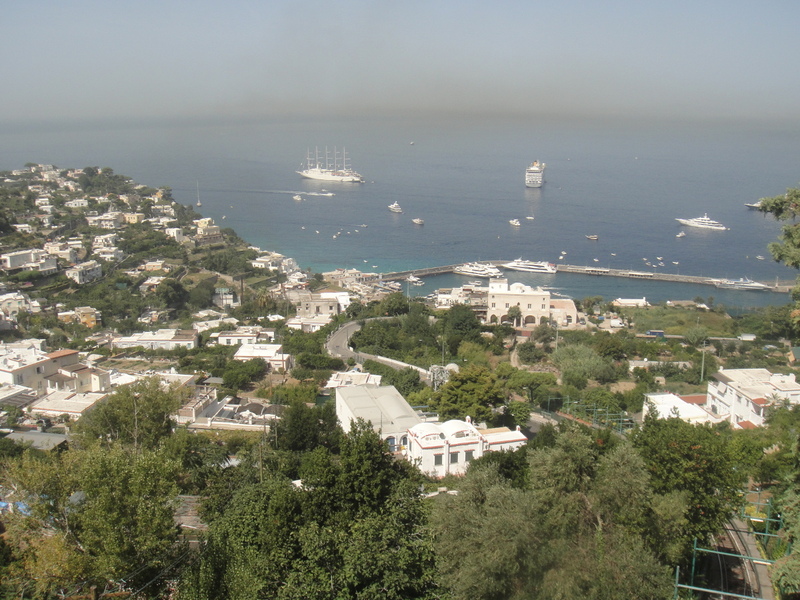 Buses from Capri to Anacapri run every 15/20 minutes, take 15 minutes and cost €1.80 (single ticket). The bus terminal in Capri is located in Piazza Martiri d’Ungheria (along Via Roma near the Piazzetta). The bus terminal in Anacapri is located in Piazza della Pace (also known as “Piazza Cimitaro”). You can also walk if you feel adventurous, it can take only 1 hour, but is it uphill. There are also taxis but they cost €20 from the pier to Capri. You can find prices, timetables, and more information at capri.com. 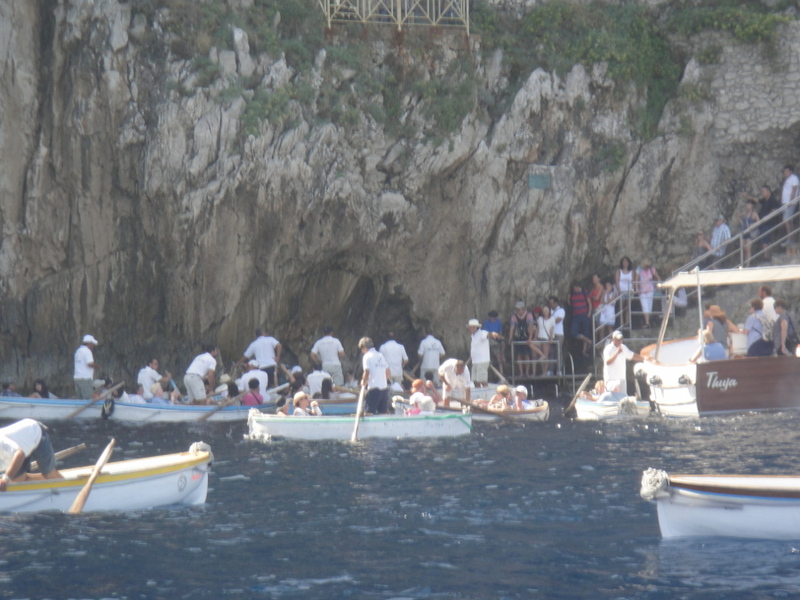 Blue Grotto (Grotta Azzurra) is one of the main attractions of the island. It is a stunning cave with a tiny opening to the sea that opens and closes with the tide. The sunlight passes through the cavity creating an amazing and breath-taking blue reflection that illuminates the cavern, as you can see in the picture below. The boat trip from Marina Grande to outside the Blue Grotto cavern costs about €9 per passenger, then €12.50 per person for the rowboat to take you in through the tiny entrance which includes the entrance ticket to the cave and demands a tip for the oarsman, with a round trip of about 1 to 3 hours [wikitravel.org]. It is open from 9:00 to one hour before sunset. At peak times the queue can be up to 2 hours long, so it is considered one of those ‘love it’ or ‘loathe it’ places. The pictures below show the contrast between the beauty of the cave and the pain of the waiting. 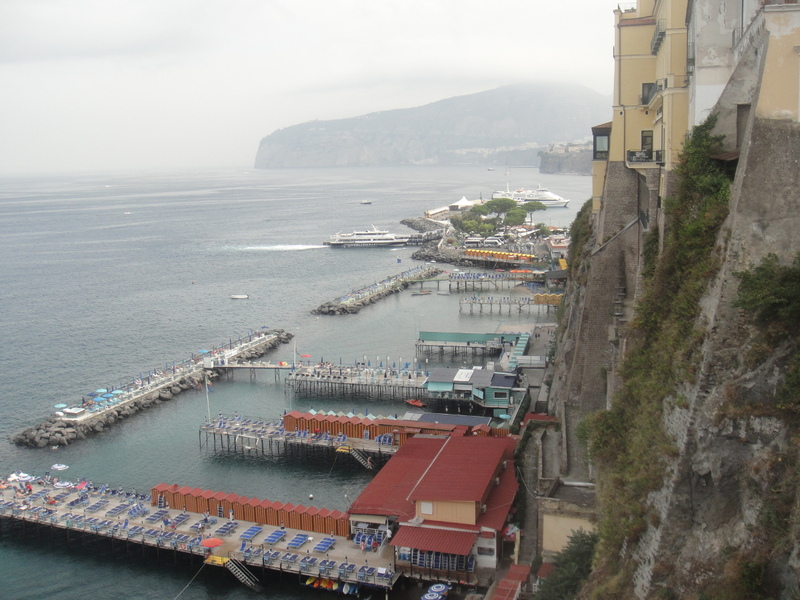 Sorrento is a much bigger town, and I did not find it as cosy and beautiful as the rest. 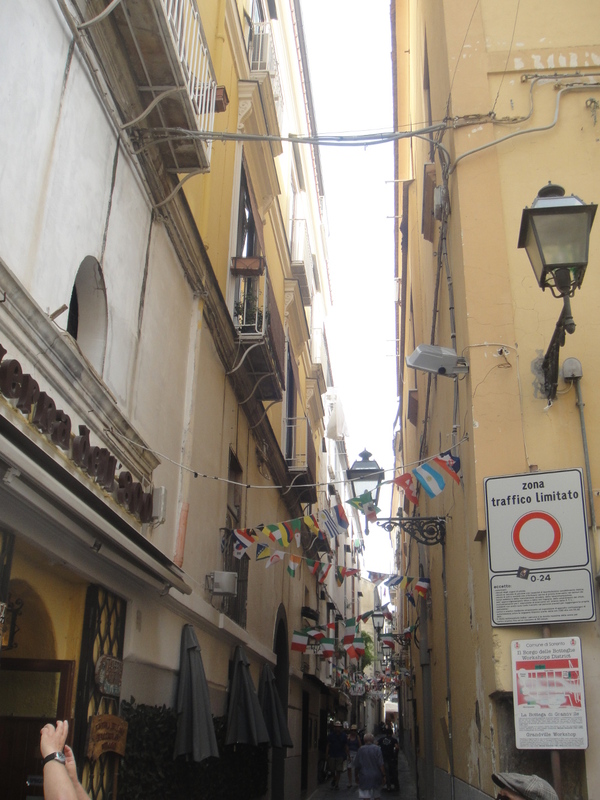 But it has more stuff to do, with little and narrow streets/alleys (see picture below) with cafes, bars, restaurants, and shops prepared for tourist. Some of its traditional products are ceramics, lacework and intarsio (marquetry items) that are famously produced here. 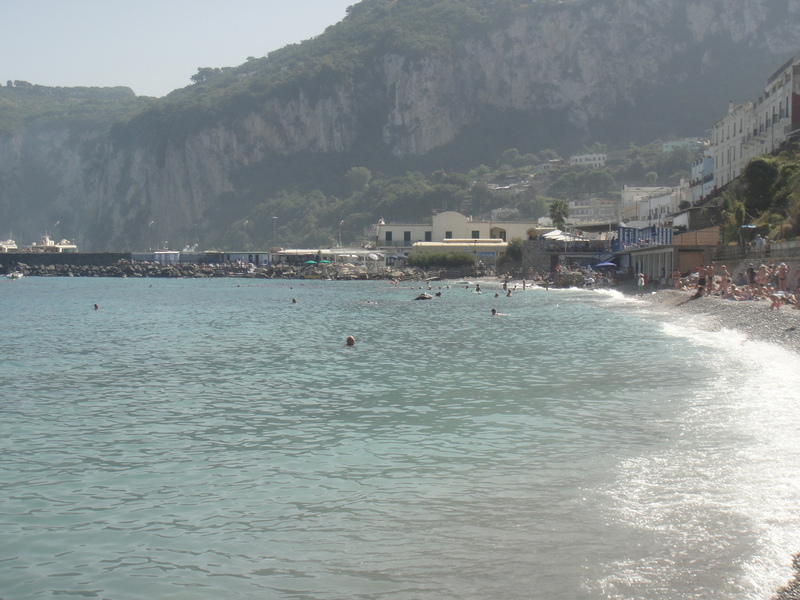 It is also quite close to Capri, so you can find a lot of ferries commuting to the Island. And is reachable by train as well from Naples. It shore has very high cliffs (see picture above) which separate the town with its pier/marinas. This can be advantageous for taking pictures from the top, but the downside is the lack of sandy beach. There is just not a good area for it. You can also find plenty of boat trips and other tours and experiences from its Marina. You can hire them online or at the kiosks there. 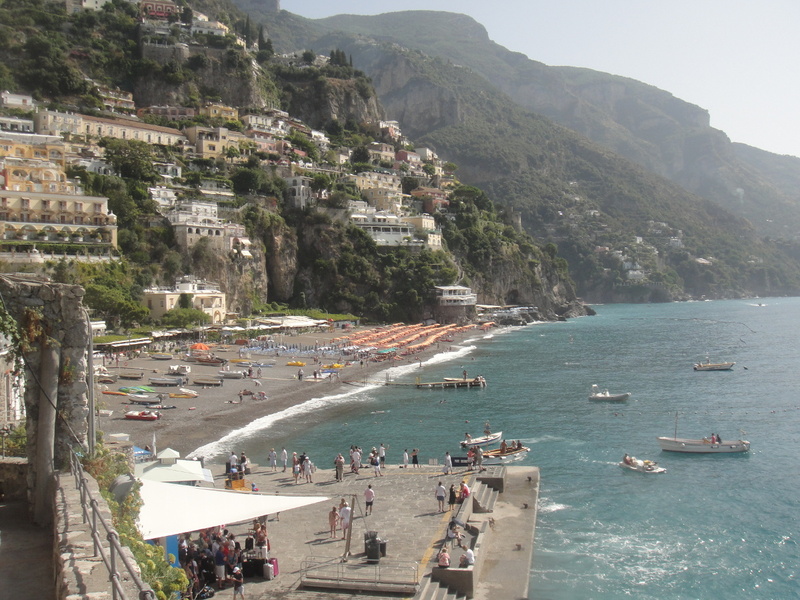 The most common ones are a cruise to Capri and a tour to Amalfi and Positano. Another emerging destination that you may want to consider is the Island of Ischia. Praiano is one of the smallest towns in the area, with only 2 km2 (0.8 sq mi). I would not recommend staying here, it should be enough to spend a day or even less. But it is worth a visit of course. 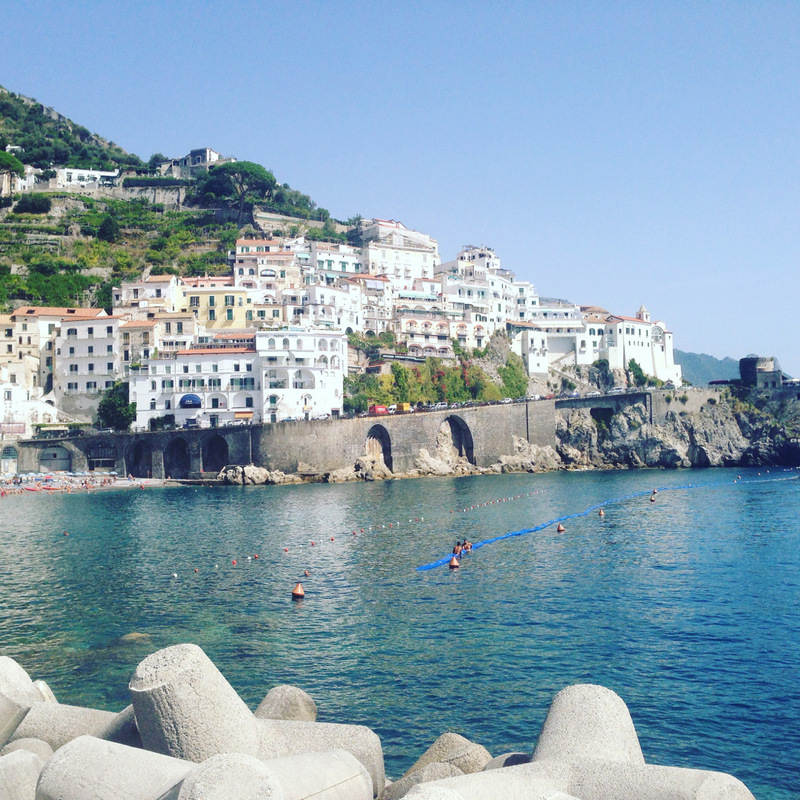 It can be almost considered “untouched by tourism” if you compare it with the other towns in Amalfi. There are many pretty passages and gardens, with fruit and vegetable patches in all kind of surfaces. One of its main attractions is Church of San Luca Evangelista, a beautiful church with fabulous ceramics in front. Another one is Chiesa di San Giovanni Battista, with a small square in front where locals hang out. There are two places I would recommend. One of them is Costa Diva Restaurant, which is #1 on TripAdvisor. The seafood, staff, atmosphere and view were excellent. Lemons hanging on in the groves gave it a delicate addition. The other one is Il Pirata (The Pirate). This is a more intimate and romantic place (the most romantic place in the area for some people). You can get a table really close to the seashore, with a gorgeous view and a relaxing vibe. Their Zuppa Di Pesce and Polpo were both delicious. Some recommended hotels are: Hotel Margherita, Hotel Villa Bellavista, Hotel Le Fioriere, Hotel Il Pino. Needless to say, Italian food is simply amazing, and it has widely spread all over the World. It is notorious the enormous influence that Italy has had in regards to food and design in general. 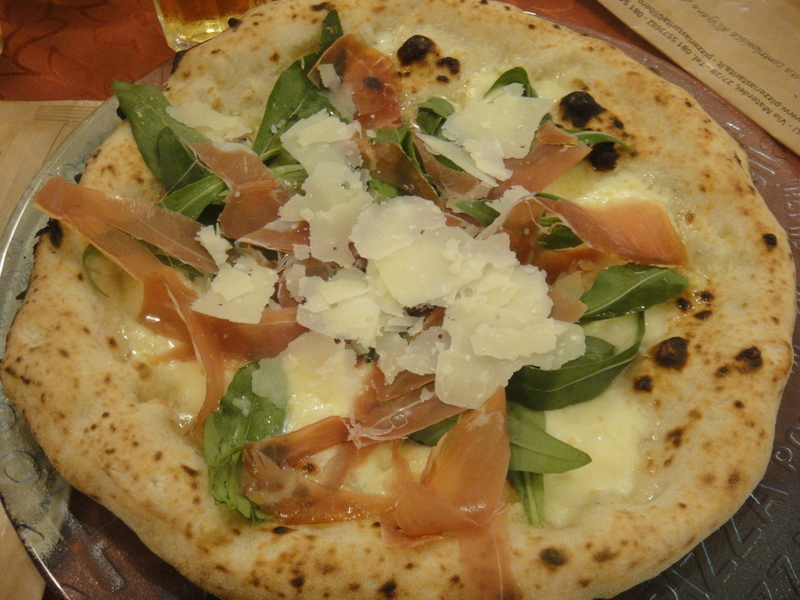 So I will not extend a lot on the subject, the must-try are gelato (ice cream), pizza (rocket, Parma ham, and parmesan! ), pasta (spaghetti “alla puttanesca”! ), paninis, mozzarella, limoncello, coffee, fish. 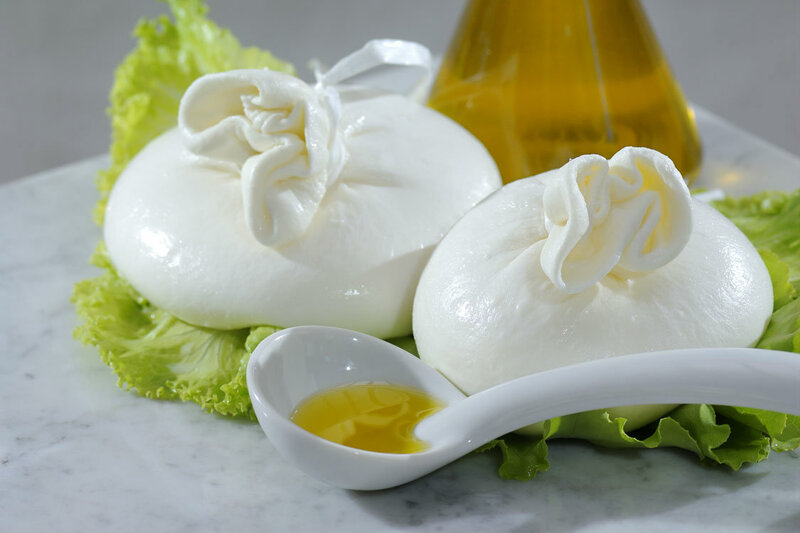 One thing I would like to highlight is burrata (see picture below), which is made with mozzarella and cream. The outer shell is solid mozzarella, while the inside contains both mozzarella and cream. 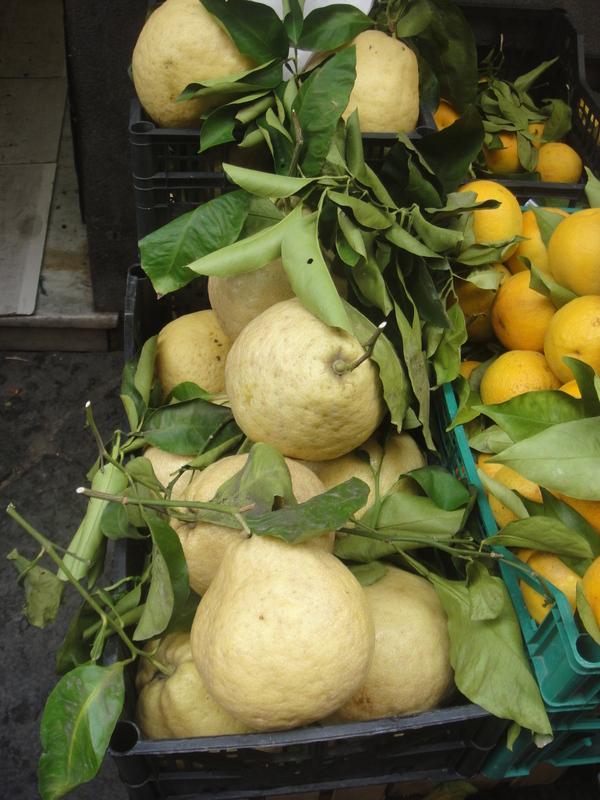 The main raw material of the area seems to be the lemon, and they have different types, like the giant ones in the picture below. You will find all kind of products and souvenirs related to lemon. The most famous of these products is Limoncello. It is a liquor usually served after dinner in small ceramic glasses that are also chilled. 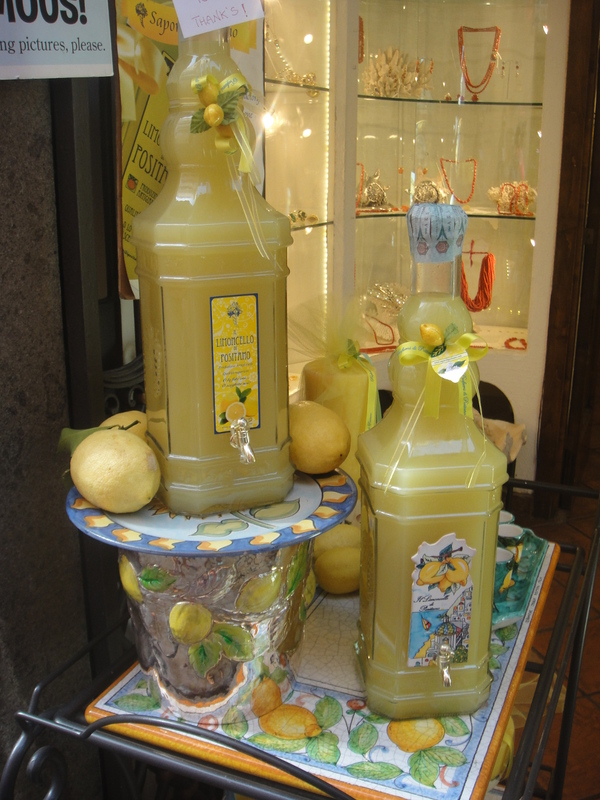 There are also many variations of limoncello such es pistachiocello (flavored with pistachio nuts), meloncello (flavoured with cantaloupe), and fragoncello (flavoured with strawberry). 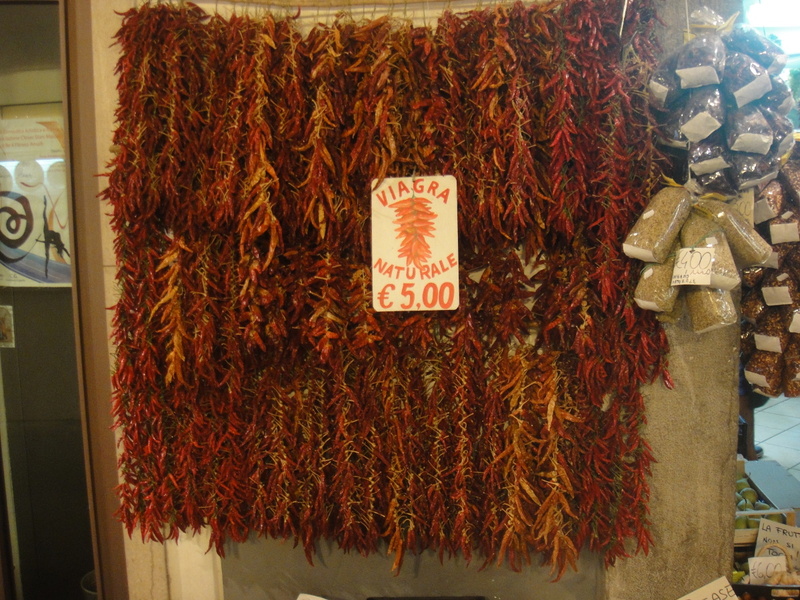 Other traditional products are different species (you will find many types of pepper), and of course all kind of pasta.